Famous people are usually known for what they do but we don’t often get to see where they do it. You can tell a lot about a person from their office so we wanted to give you a run down of a few offices occupied by famous figures around London. 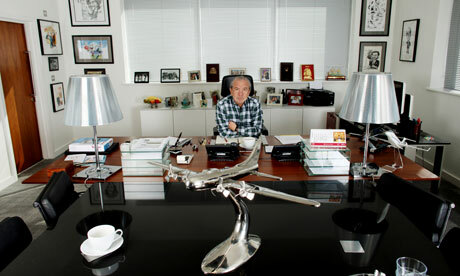 Thanks to his hit TV show The Apprentice, Lord Sugar is one of the most famous businessmen in London so we wanted to take a sneak peek into his office to show you where the magic happens. As he sits to survey his technology empire, Lord Sugar is greeted by a huge piece of mahogany that stretches out in front of him like the long bonnet of his Rolls Royce. The two brushed chrome lamps that sit on his desk balance out the traditional grandeur of the wood that leaves his office feeling contemporary but still full of character. Have a look at where David Cameron spends his 9 to 5. As you can see his office is decorated quite conservatively which isn’t surprising. Did you really expect a hot pink feature wall at No.10? David manages to keep his office feeling homely by displaying plenty of family photos. If you’re in an office that feels a little sterile or unfriendly, family photos are a great way to make yourself feel more comfortable. From one famous David’s office we go to another – David Brent’s. David’s office is typical of most managerial offices around London. There’s the off-white walls, the laminated wooden desk, the cork noticeboard and the swivel chair which is perfect for anyone looking to impersonate their favourite Bond villain. It can often be difficult to make an office such as this feel original and exciting but adding some colour with a feature wall or hanging an artwork is sure to freshen the whole space up – the same can be said for the office as a whole. Of course not everyone chooses to have his or her office in a pickle shaped building in the centre of London. Sometimes people choose to locate themselves where they feel most comfortable and that often means working from home, which is the case for author Martin Amis. A home office is great for anyone who prefers peace and quiet during the day rather than the buzz of a busy office. Martin’s office benefits from a clear glass ceiling which is sure to let in a lot of light and in terms of decoration, the white walls are great for keeping a clear mind. At first glance this office might look like something out of a film rather than somewhere work is actually done. But believe it or not this is the office of Simon Cowell and it is believed that on a clear day you can see him gazing out of it over the city, just as he is in the photo. His office is about as minimalist as it’s possible to get without having an empty room. The effect of this, along with all the shiny surfaces, is a striking one that’s sure to intimidate anyone that goes into it. Hopefully these offices have given you an insight into how famous people decorate their office and shown you what you could achieve with yours. Our team of professional commercial painters and decorators in London are always here to help, so if you need any more inspiration or advice on office decoration or residential painting and decorating just give us a call.